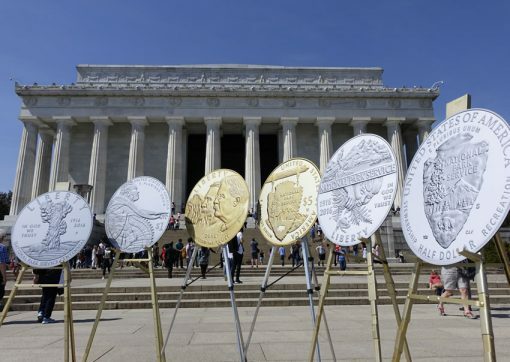 On Thursday, March 24, the 2016 National Park Service 100th Anniversary Commemorative Coins were ceremoniously launched near the Lincoln Memorial in Washington, D.C.
Large prints of the 100th Anniversary of the National Park Service Commemorative Coins are displayed at the Lincoln Memorial during the ceremonial opening of sales March 24, 2016. The second of two commemorative coin programs for 2016, surcharges from the sale of the coins have been authorized to be paid to the National Park Foundation. U.S. Mint photo by Sharon McPike. The U.S. Mint, National Park Service and National Park Foundation introduced and then opened sales of the collectible coins. Buyers claimed 62,977 of them in the first day. "These coins — mementos today and heirlooms tomorrow — celebrate the centennial of the National Park Service," said National Park Service Deputy Director Peggy O’Dell. "Their purchase will help support vital park programs and contribute to the centennial legacy." 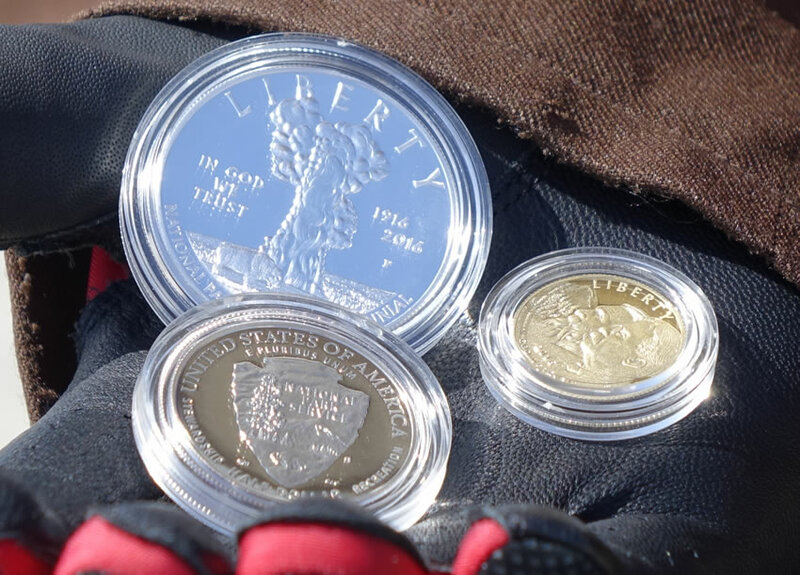 Options include $5 gold, silver dollar, and 50c clad in collector qualities of proof and uncirculated. As CoinNews wrote about earlier, all four U.S. Mint production facilities participated in making them. Each bears a mint mark denoting where they were struck with ‘W’ for West Point; ‘P’ for Philadelphia, ‘S’ for San Francisco; and ‘D’ for Denver. Victor Knox, National Park Service Associate Director for Park Planning, Facilities, and Lands, U.S. Mint Principal Deputy Direct Rhett Jeppson, Gerry Gabrys (Guest Services, Inc.), and National Park Foundation President Will Shafroth stand with Washington National’s Teddy Roosevelt after the ceremonial sales kick-off for the 100th Anniversary of the National Park Service Commemorative Coin. Surcharges from the sale of the coins have been authorized to be paid to the National Park Foundation. U.S. Mint photo by Sharon McPike. Proof coins are almost always more popular. They stand out because of their frosted designs and mirror-like backgrounds. For the first day, the proof-to-uncirculated sales ratio was 3-to-1. 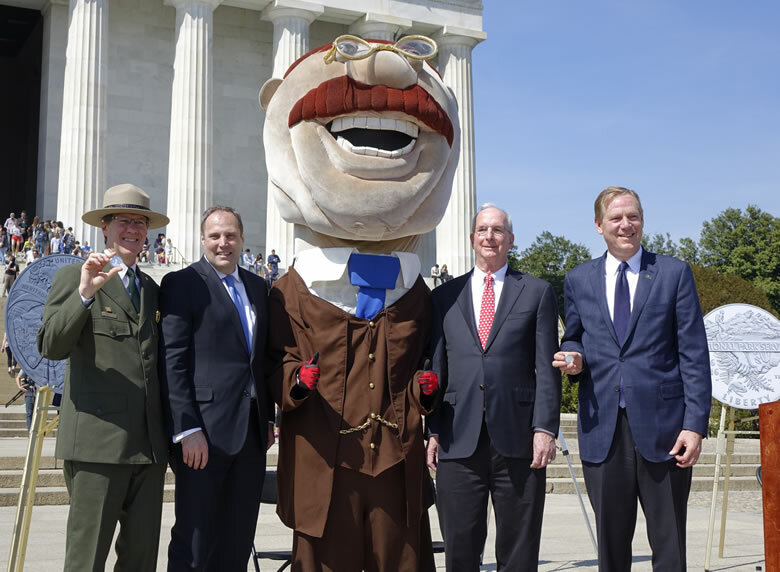 Washington Nationals’ Teddy Roosevelt holds three 100th Anniversary National Park Service Commemorative Coins after the March 24, 2016 sales kick-off ceremony at the Lincoln Memorial. U.S. Mint photo by Sharon McPike. To order the commemorative coins, visit the United States Mint’s online store, right here, or call 1-800-USA-MINT (872-6468). I am still surprised that the Three-Coin set did not sell out and that only a little over 6,000 were sold on the first day. If the limit was higher (let’s say five), I believe they would have sold out. Each coin is being made way more than the 15,000 they are making for the set… at close to $500 and one of the coins being clad,I kind of understand…all that being said,I do like the set, but didn’t order it tho would like to…. Personally I enjoy owning sets. It seems that these opening numbers are very low for a commemorative coin. Not surprising as it seemed that most of the coin collectors on this site gave this series a 2 thumbs down. Mike or Darrin do you have any stats on how these opening sales ranked with other commemorative coins? The first day sales numbers for the 2016 MT coins I found are approximate: $5 gold Proof 5,000 & Uncirculated 2,000. The MT silver $1 first day sales were 23,900 Proof & 9,600 Uncirculated. Thanks Seth for the info. Those #’s are really low I guess since I think the MT #’s were also low. Not a lot of interest. Maybe a failed coin design? You would think with all of the parks employees you would sell a little more than what we are seeing here but I guess they don’t even see an interest in it. It is strange for sure (low first day sales) since there are over 400 National Parks & historic sites run by the NPS & lots of employees. Maybe they didn’t get the memo/e-mail yet due to being way out in nature somewhere too far from a cell phone tower/wi-fi service! Yeah MAYBE. Or maybe they think they should just be given one of each for their dedicated service. Oh no… That could cause a conflict years from now when the Gov comes after them for having US MINT coins the Mint claims (then) that was illegally obtained. Who knows? Or maybe… They “lost” those emails from their government server. Hmmm? Interesting possible conspiracy theories ! Lol. I have seen stranger things happen in our shared hobby for sure. And forgot to mention annual mint sets. Who is going to collect all of these? You are so right. About 250 products each year in recent years! No wonder sales started dropping off in 2014 including for some core annual sets. It costs about $25,000 to buy one of each product for the year during the past few years. Crazy. Good and valid points. Too many offerings this year for sure. I believe that there are too many commemorative coins being issued each year. The public seems to be loosing interest. It is time to re-think future issues and maybe do up to two a year. Also, with the Gold 1916-2016 Dime, Half and Quarter about to come out, collectors on a budget have to choose wisely. Federal law since 2000 allows only up to two commemorative coin programs in any given year by the U.S. Mint. I just opened up my two sets of the “2016 National Park Service” Three-Coin set. I got the three coin Parks set and it truly is a great looking set. I wish the mint would get its act together and package the three new 1916-2016 Gold anniversary coins in a single box. Mercury Dime-Standing Liberty Quarter, Walking Liberty Half. I got the Mercury dime the other day and one could place 10 dimes in the oversized package they put the single dime in! That is a great idea. A three-coin set would be awesome.